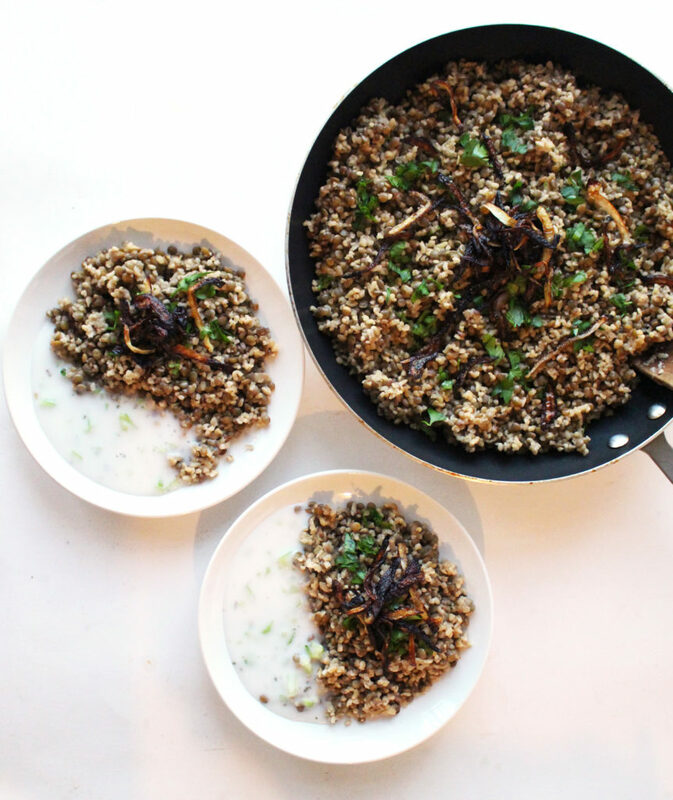 This simple one-pot mujadara can be done in 45 minutes or less and is packed with protein and fiber! 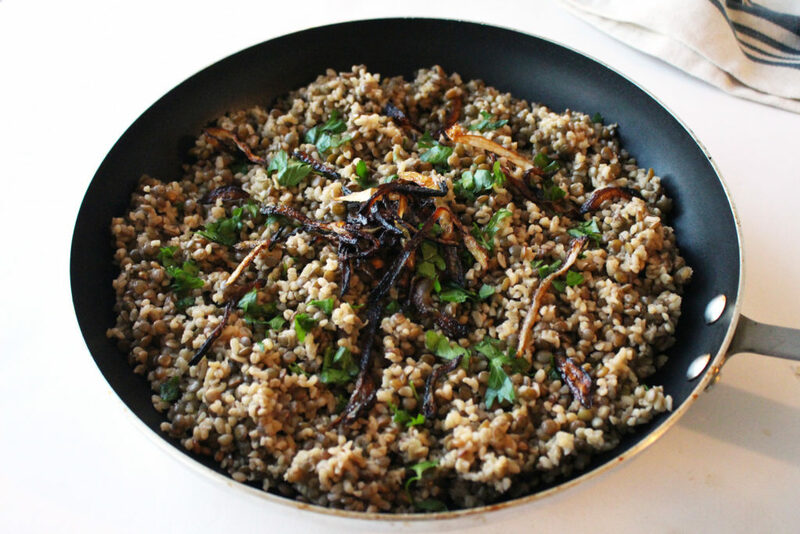 Mujadara is a traditional Mediterranean grain and lentil dish served across many Middle-Eastern countries with slight variations. 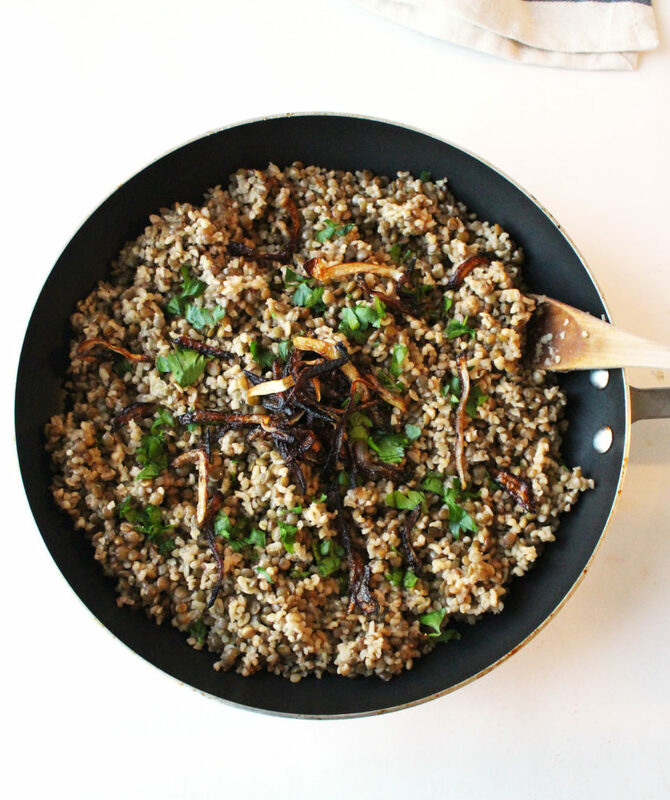 The Syrian way often uses bulgur instead of rice, making it healthier as it has much fewer calories than rice with twice the fiber and almost 4 times the folate, which plays a vital role in DNA synthesis! 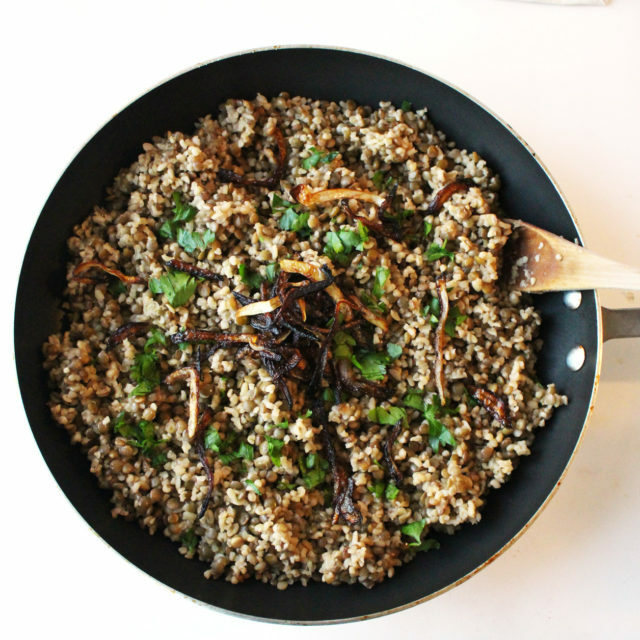 The bulgur also results in a softer, chewier texture than rice, and I personally find it to be much more filling, making this the perfect complete meal. Mujadara is always topped with crispy fried onions, which add a delicious sweetness and crunch to every bite. When I was younger, this vegetarian dish was my favorite Arabic recipe, and I would always request for my mom to make me “lentils and rice!” Although seemingly simple, there is something so satisfying about the way the flavor and texture of lentils and grain meld in this dish. I would also always sneak some crispy fried onions from the plate when my mom was not looking as she prepared the dish; they are addicting! 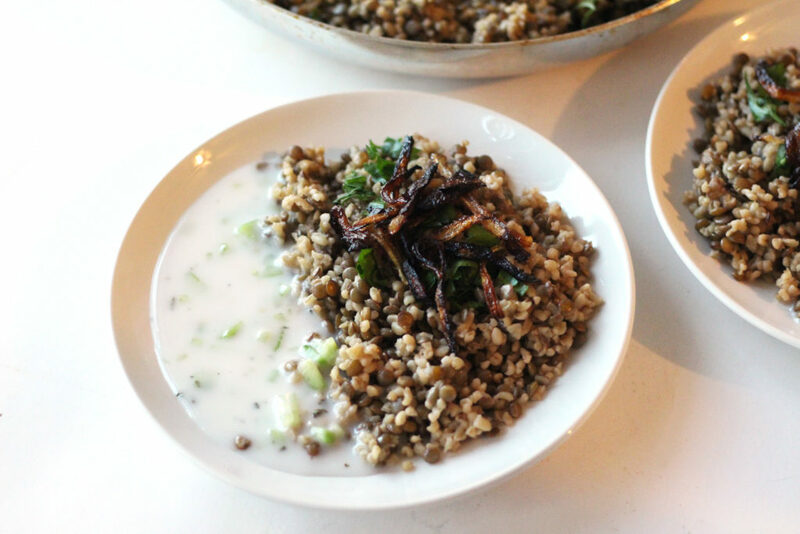 Mujadara is typically served alongside cool yogurt, often cucumber mint yogurt. Upon discovering a vegan alternative, coconut yogurt, at my local Sprouts, I knew I had to try it in this dish, and it worked wonderfully! It is slightly sweeter than traditional yogurt, but with some salt and lemon juice, the taste is perfect. I hope you enjoy this classic Middle Eastern dish as much as I do! Let me know in the comments below if you try it, and I would love to see your recreations on Instagram @zenanzaatar! 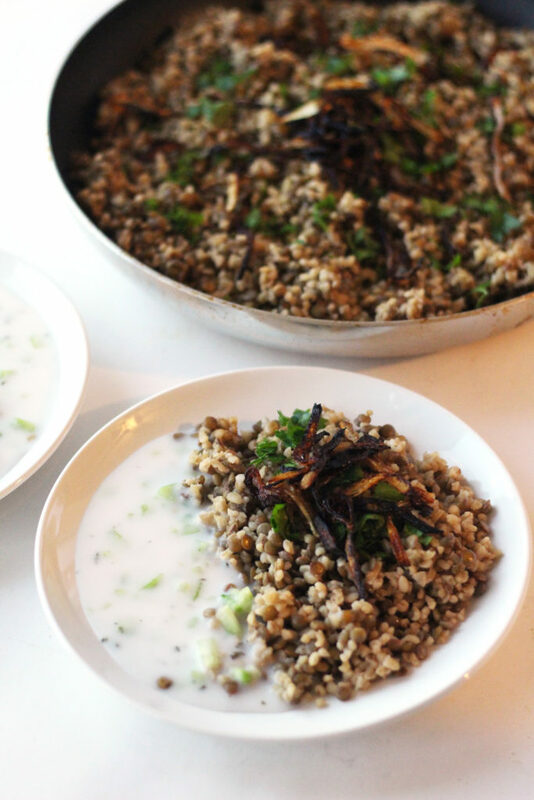 One-pot mujadara, a traditional Middle-Eastern lentil and bulgur dish, topped with crispy onions and served with vegan cucumber mint yogurt. Wash and drain lentils and bulgur thoroughly. Add lentils and bulgur to a pot with water and bring to boil. Once boiling, turn down the heat to low and simmer, covered, for 25-35 minutes. 15 minutes into cooking time, add salt and 1 tbsp olive oil. * At 25 mins, check if the lentils are tender. Prepare yogurt by mixing coconut yogurt, lemon juice, salt, garlic, mint, and water, until smooth. Fold in diced cucumber. Top the hot mujadara with crispy onions and serve with a side of cool cucumber mint yogurt; enjoy! *For oil-free method, omit the 1 tbsp of olive oil when cooking lentils and bulgur. 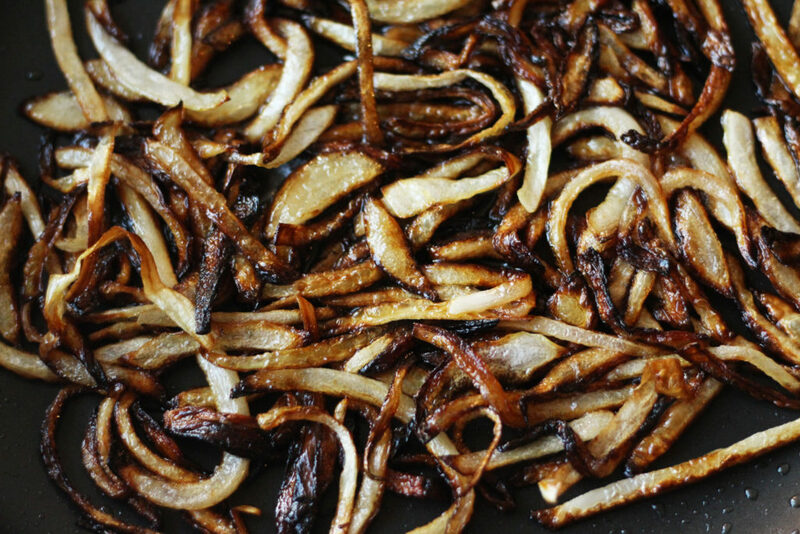 **To make oil-free caramelized onions, add sliced onions along with 1 tsp of salt to a non-stick pan, to draw out the moisture. Heat over medium-high heat, stirring frequently to make sure they don't stick. If needed, use 1-2 tbsp of water at a time to de-glaze the pan. Once browned to your liking, set aside the onions. This will take about 15 mins. Do you add any spices? I plan on making it without yogurt for now.